Crossing the line in the lead to win the World Championships is a feeling that will never be forgotten. As with most races that go well, it’s a relief that immediately floods in, closely followed by a deep lactic acid burn! After the final in Korea I felt this like never before and really couldn’t enjoy the moment. We cross the line, stop, slump down in our seats and there’s a few shouts, a fist pump or two. Phelan the cox still has fully functioning limbs, so he stands and celebrates with exuberance for us. I’m in a bit of a state after this one, my vision is blurred and I can hardly bend my knees to row on again as Phelan directs us over to the landing stage to receive our medals. I crawl out of the boat, head pounding and really have to put in a huge effort to stand upright. We all congratulate each other there and then with big manly hugs, although mine I’m sure are limp and weak. We are of course all genuinely pleased for each other. This time we have done something that has never been done before – no other British eight has won the World Championships title. It’s something I was very proud to have achieved and to have been a part of. A moment with Andy, winning is a bonding experience! For me personally, this has been an extremely special trip. As a family we have become accustomed to events happening around us, with me often having to miss them. A wedding here, a party or family get together there, but never before have I missed quite such an important event. Daisy was born on 25 August, the night before our first race in Korea. Luckily I was present for the birth of Jasper nearly four years ago, but sadly this time I was 5,600 miles away. We expected this and planned accordingly. It was possible that she could be born once I had returned back home, but it was going to be unlikely. Low and behold, the day of our first race and still a week to go in Korea, things started happening back home. I went to bed knowing that at some point in the night I would be awoken by a call from my mother-in-law, telling me of the birth of my little girl. At around 2.30am I was awoken by a call. Clambering out of bed and rushing into the corridor I was told Daisy had been born and all was well. I obviously didn’t say much or appear particularly emotional because I kept being asked if I was okay. I was more than okay. I was exceedingly happy that everything had gone smoothly, that baby and mum were fine – I was just tired and had a race the next day! So, waking the next morning on a bit of a high, I told my teammates, who were all incredibly supportive. We raced the heat with conviction and excitement. It had felt like a long build-up to the start of the competition and we were all itching to stretch our legs and get out there to race. We won the heat, beating the USA who had so convincingly beaten us just a few weeks earlier in Lucerne. It was a great start to the regatta and a day I will never forget. The day I missed my daughter’s birth! Qualifying straight for the final meant that we now had a week to sit and twiddle our thumbs. Of course, training continued and actually it was imperative that we continued to keep our bodies ready to race and in sharp form. It’s such a difficult task to find the balance between race preparation and enough rest. We dealt with the training well, using two days in the middle of the week to fit in some long race pace pieces, which gave us a good couple of days for recovery in the lead-up to the final. It was a difficult time for me because I was so eager to get back to meet my new little girl. I spoke regularly on Skype and was sent photos daily but it was no substitute. However, we had a major job to do and I had to make sure I remained focused and showed the other guys that my mind wasn’t wandering back home too much. drop-off between each quarter. To maintain speed throughout the length of the course sounds obvious, but it is mentally and physically a difficult thing to do. It’s a hard way to race and makes for a painful journey, but there’s no doubt that’s what we did and needed to do. The Germans had the lead over us to the first marker, but over a matter of a few strokes we managed to pull in front and ease ahead. This was our plan working – keeping the speed up, not letting it drop and pushing out into the lead. We kept inching ahead and really pushed into a commanding position through the middle of the race. Normally this would be a good feeling, but honestly I wasn’t aware of where we were relative to the other crews. My eyes were boring into Pete’s back in front of me, concentrating solely on pushing my legs; my mind was shut off to how much this race was hurting! The lead we gained grew a little and we maintained it through the main body of the race. In the closing few hundred metres the German crew came back at us fast with a sprint that was noticed, but they were running out of room to catch us. 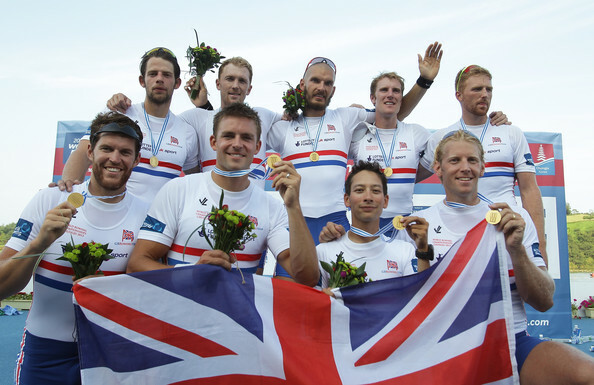 We ended up winning by a small margin to become the first British crew ever to win the World Championships gold in an eight. Back in 2009 at the start of the new Olympiad, I ended the season with my first Worlds win. It was a good start to the run-up to London, and now we have started the same way in the run-up to Rio 2016. Time is ticking; I must now keep the momentum going! The whole crew celebrating our medals - Tom and Moe kindly holding me up!